The Greylag Goose is Britain’s only native breeding goose. By the late 1900s, continuous persecution of the species had caused a dramatic decrease in numbers and a large reduction in range, so much so that the population was restricted to the extreme north and west of Scotland. This small population became known as the ‘Northwest Scotland’ population. A ‘Re-established’ population was established in southwest Scotland, Wales and parts of England through releases of birds mainly in the 1930s and 1960s, derived from eggs taken from sites in the north and west of Scotland. In recent decades, both of these populations have greatly increased in number and range, and have gradually overlapped to the point where it has become impossible to treat them separately. As a result, since 2010 all Greylag Geese breeding in Britain are recognised as a single British Greylag Goose population. Northwest Scotland: proportion of young generally fluctuates between 20% and 30%. 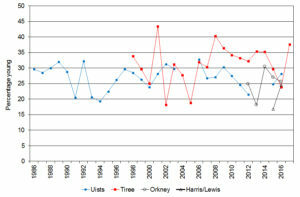 Five-year mean of 34% in flocks on Tiree (2010 – 2014) and 26% on the Uists (2008 – 2012). Rest of Britain: 24% young recorded during 2000 census. The Greylag Goose used to breed in the wild in the East Anglian fens, Lancashire, the Lake District and probably many other parts of Britain. By the early 1900s, however, the species was restricted to the extreme north and west of Scotland as a result of almost continuous persecution that caused a dramatic decrease in numbers and range contraction. Numbers began to increase from the 1950s, probably due to a reduction in persecution through changes in legislation in Britain, the establishment of protected areas, and the fact that the geese began to take advantage of the increase in the quantity and quality of the improved pasture available. In England and Wales the creation of gravel pits and other man made waterbodies provided additional habitat for nesting. Greylag Geese breeding in Britain were until recently considered to comprise two separate populations: one breeding in Scotland primarily on the Outer Hebrides, Coll and Tiree, and in parts of Caithness and Sutherland, other Hebridean Islands (e.g. Mull), on coastal areas of Wester Ross, and in Orkney and Shetland, which is the remnant of the native population that used to be more widespread (Mitchell 1999, Mitchell et al. 2011); and a second breeding in many areas of Scotland to the south and east of the Great Glen and in England and Wales that is largely derived from re-established stock taken as eggs from sites in north and west Scotland, primarily Loch Druidibeg in the Outer Hebrides (Owen & Salmon 1988, Mitchell & Fox 1999). Both segments of the population have recently increased greatly in number and range. In some parts of Scotland the populations overlap and are therefore indistinguishable. The geese now breed throughout Britain and there is modest interchange of individuals between the two populations making delineation difficult to justify. As a consequence, since 2010 Greylag Geese breeding throughout Britain have been treated as one population (Mitchell et al. 2012). Most birds moult close to the breeding areas, although large numbers of non-breeders are known to gather at key moult sites. For example, Loch Loyal, Sutherland, attracts non-breeding birds from a large part of northern Scotland and Loch Leven, Perth & Kinross attracts non-breeding birds from the Lothians and Fife. The main winter habitat is thought to have been saltmarsh and coastal Scirpus beds, but as little of this now remains in Britain, the geese switched to feeding on arable land and improved pastures centuries ago. The birds favour cereal stubbles, oats and ryes during the autumn and grass is used throughout the winter. This has brought them into conflict with crofters and farmers who believe the birds damage their crops and cause reduced yields. Sown grass and permanent pasture are used in the spring, and, in Scotland, moorland vegetation is particularly important in June/July during the moult period. The birds roost on estuaries, coastal sandflats and freshwater lakes, lochs and mires. Most breeding areas include extensive open waters (coastal or inland) with dense vegetation, such as heather, and have ready access to suitable grazing pasture and wetlands. Mitchell, C. 1999. Greylag Goose Anser anser: Scotland. In: Madsen, J., G. Cracknell & A.D. Fox (eds.). 1999. Goose populations of the Western Palearctic. A review of status and distribution. Wetlands International Publication no. 48, Wetlands International, Wageningen, The Netherlands/National Environmental Research Institute, Ronde, Denmark. Mitchell, C. & A.D. Fox. 1999. Feral Greylag Goose Anser anser: United Kingdom. In: Madsen, J., G. Cracknell & A.D. Fox (eds.). 1999. Goose populations of the Western Palearctic. A review of status and distribution. Wetlands International Publication no. 48, Wetlands International, Wageningen, The Netherlands/National Environmental Research Institute, Ronde, Denmark. Mitchell, C., R.D. Hearn & D.A. Stroud. 2012. 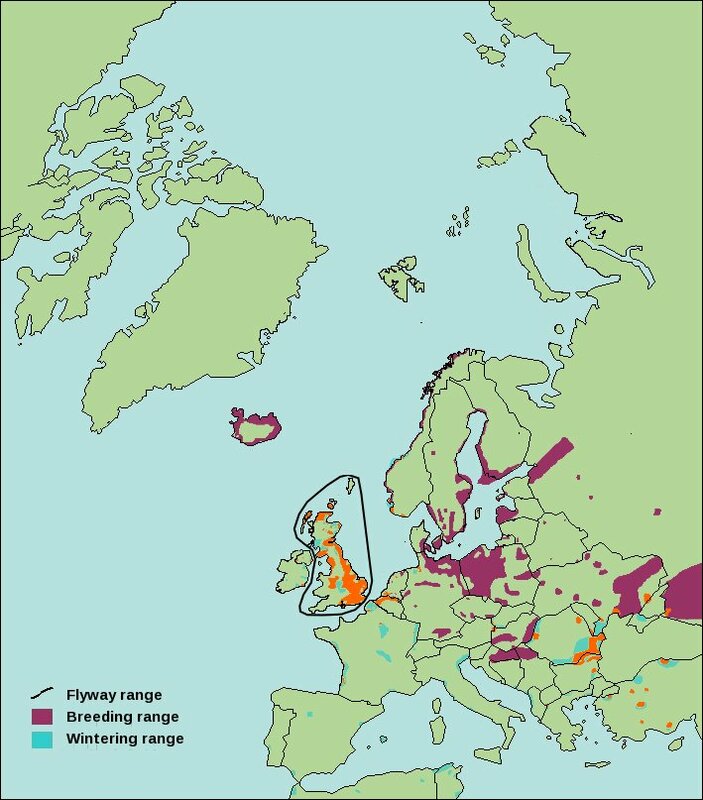 The merging of populations of Greylag Geese breeding in Britain. British Birds 105: 498-505. Mitchell, C., L. Griffin, M. Trinder, J. Newth & C. Urquhart. 2011. The status and distribution of summering Greylag Geese in Scotland, 2008/09. Bird Study 58: 338-348. Owen, M., & D. Salmon. 1988. Feral Greylag Geese Anser anser in Britian and Ireland, 1960-86. Bird Study 35: 37-45. An annual census of the whole British Greylag Goose population is not undertaken, in part due to the remoteness of the northwestern reaches of the population’s range. Annual counts are, however, conducted at several key areas in Scotland by Scottish Natural Heritage (SNH), including i) Orkney, ii) the Uists, Outer Hebrides, and iii) Tiree, Inner Herbrides. These areas are local goose management schemes administered by SNH in order to alleviate damage to farming interests and are therefore of high interest to conservationists and land managers alike. A count is carried out in late August to provide a post-breeding population total before the shooting season starts in September. On the Uists, a second count is carried out in early February to provide a post-shooting population total before the birds start to move off crofting land to the more inaccessible breeding areas. The difference between the two count totals provides an estimate of winter mortality. To assess reproductive success, assessments of the proportion of young in the flocks and of brood size are made in August on both the Uists and Tiree. Results from these counts are summarised on the ‘Latest results’ tab. Find out more about age assessments. 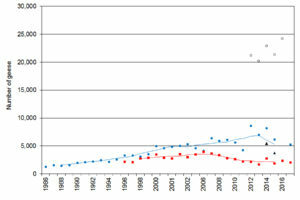 Complete censuses of the British population in Scotland were undertaken in summer 1997 and 2008-2009 to estimate population size and breeding success in Scotland. The most recent census also provided valuable information on the overlap between the former ‘Northwest Scotland’ and ‘Re-established’ populations which allowed their population status to be reassessed. The future frequency of this census has yet to be determined. Results from these surveys can be found on the Reports & newsletter page. Archipelago-wide surveys of British Greylag Geese in Orkney have been undertaken each August since 2012. The aim of the surveys are to assess the abundance, distribution and breeding success of the population on the islands. Surveys involve field and age counts, and a random stratified survey. Results from these surveys can be found on the Reports and newsletter page. The abundance of British Greylag Geese are also monitored throughout Britain through the Wetland Bird Survey (WeBS), although low coverage of the whole population means a comprehensive assessment of total population size is not possible. Data are, however, used to produce trends for the population. Results from WeBS are presented in an annual report. See the WeBS website for details. The abundance of British Greylag Geese in Britain during 2017/18 was monitored through the Wetland Bird Survey (WeBS). Results are presented on WeBS Report Online. Annual monitoring of the whole British Greylag Goose population is not undertaken, but annual counts have been carried out in four key areas in Scotland where Greylag Geese are actively managed, namely Orkney, the Uists (Outer Hebrides), Tiree/Coll (Inner Hebrides) and Harris/Lewis (Outer Hebrides) in some years. In 2017, no counts were undertaken in Orkney, nor in Harris/Lewis. On Tiree, the late summer (August 2017) count totalled 2,039 geese (Figure 1), a 13.5% decrease compared to the previous year. On the Uists, 5,268 Greylag Geese were counted in the early September census (Figure 1), a decrease of 20.4% on the previous year, but this was after shooting had started in early August. During a second count in late February 2018, 4,892 geese were counted. Figure 1. Late summer counts of British Greylag Geese on the Uists (blue circles), Tiree (red squares), Orkney (black open symbols) and Harris/Lewis (black triangles) 1986 to 2017. Five-year running means shown as lines. Estimates of annual breeding success of British Greylag Geese is not undertaken at a representative range of sites, but have been carried out in four key areas in Scotland where Greylag Geese are actively managed, namely Orkney, the Uists (Outer Hebrides), Tiree/Coll (Inner Hebrides) and Harris/Lewis (Outer Hebrides) in some years. In 2017, no age counts were undertaken in Orkney, nor in the Outer Hebrides. Breeding success on Tiree was estimated at 37.6% young in late summer flocks (n=1,810), with a mean brood size of 2.45 young per successful pair (n=278) (Figure 2). Figure 2. The percentage of young British Greylag Geese recorded on the Uists (blue circles) 1986–2016 (no data were collected in 2004, 2005, 2013 or 2014), on Tiree (red squares) 1998–2017, on Orkney (black open symbols) 2012–2016 and on Harris/Lewis (black triangles) 2015–2016. 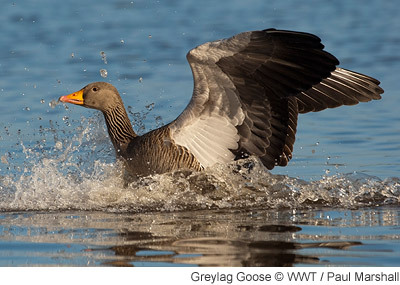 The long-term increase in the abundance of British Greylag Geese in Scotland led to calls to control numbers in key areas where the geese interacted with agricultural economic interests. Three areas in Scotland were chosen for pilot adaptive management schemes (Orkney, the Uists and Tiree/Coll) and these areas have been subject to recent licensed shooting during the close season as well as an increase in shooting during the open season. In 2015, the management scheme was extended to Harris/Lewis. The number of Greylag Geese counted on the Uists in September 2017 (5,268) was 20.4% lower than the previous year. Shooting there appears to have led to a stabilisation in numbers with a slight decrease in the most recent two years. The goal of the pilot management scheme on the Uists is to bring the summer population down to 3,600 to 4,400 birds (SNH in litt.). Numbers counted on Tiree in late August 2017 (2,039) were 13.5% lower than the previous year. The current peak counts of Greylag Geese on Tiree, at any time of the year, are just over a half of what they were in 2006. Under the management scheme, the target population range for Greylag Geese is of 1,350 to 1,650 birds on Tiree and 300 to 550 birds on Coll (SNH in litt.). No counts were undertaken on Harris/Lewis nor on Orkney in summer 2017, so a comparison with previous years is not possible. Goose and age counts from Tiree were kindly provided by John Bowler, and counts on the Uists were provided by SNH. The majority of these projects have used white or yellow leg rings, or grey or orange neck collars. Sightings of marked British Greylag Geese can be submitted in the usual way. Mitchell, C., D. Patterson, P. Boyer, P. Cunningham, R. McDonald, E. Meek, J.D. Okill & F. Symonds. 2000. The summer status and distribution of Greylag Geese in north and west Scotland. Scottish Birds 21: 69-77.